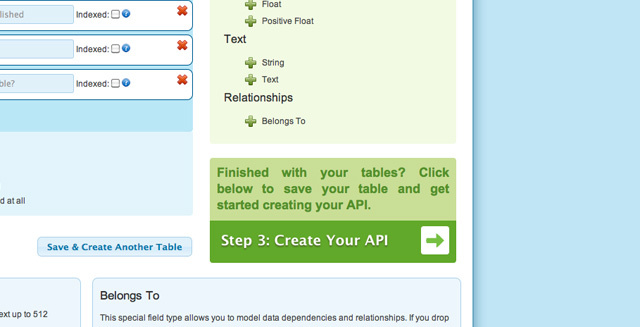 Having created an app, now you're ready to create some database tables to store your app's data. Similar to creating your app, the process is broken down into steplets which we'll cover below. Begin by entering a title for your table. Seeing as the table stores a collection of related objects, it's a convention in Kumulos that your table names should be plural. For example, "Books" instead of "Book". Kumulos will enforce this rule when saving the table, so if you enter "Book" it will become "Books", so don't worry if you make a mistake. 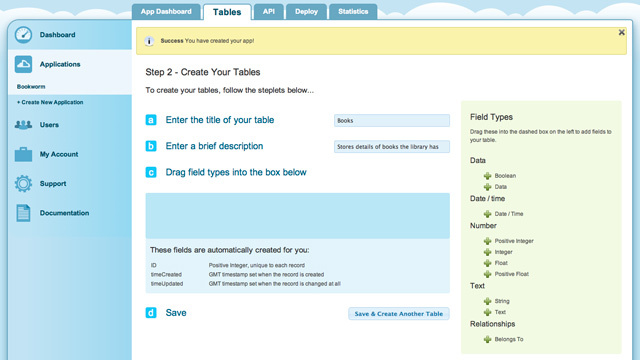 You can enter a brief description of the table and what it stores in the table comments field. Our example shows the creation of a "Books" table for our "Bookworm" app. This table will store various information relating to books including a title, publisher, author, ISBN and published date. We also store a flag to indicate if the book is available in a digital format. 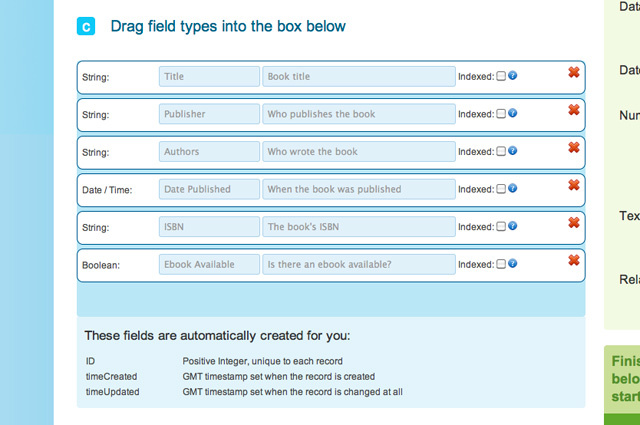 To add fields to your table, you simply drag field types from the right into the blue box. When you drop the field type, it will become a field on your table. Each field should have a unique title set, and you can add comments if you wish. If you decide you don't need a field, you can remove it by clicking the large red cross in the top right corner of the field. To make your life a bit easier, Kumulos will add fields for the record's unique ID (called a primary key), its creation time, and the time it was last updated. We take care of setting up these fields and inserting their values so you don't have to. The primary key will take the form of your singular table name plus "ID". For example, a "Users" table's primary key will be "userID". 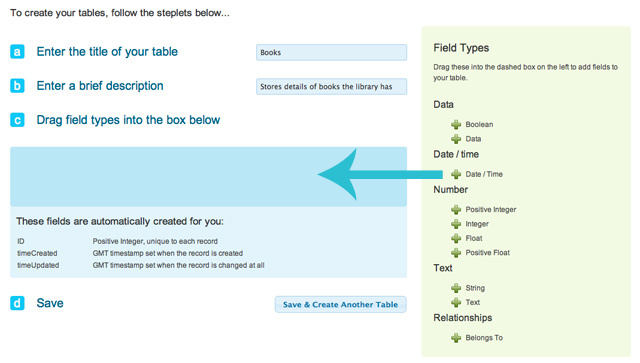 After adding your fields, you can save and create another table. Don't worry about getting your table exactly right first time, you can always come back and edit existing tables later.